Posted on October 27, 2015 - Get free updates of new posts here. Email marketing offers one of the highest return on investments possible with the ability to market to your subscribers ongoing, for next to nothing after the initial cost and effort to get them. Once you’ve built an effective email marketing strategy however what more can you do? Well, one way you can take your email marketing to the next level and utilise the database of prospects you’ve painstakingly built is through CRM Remarketing which is now possible on three of the biggest advertising networks – Google, Facebook and Twitter. CRM Remarketing involves uploading your email database onto an ad network to create an advertising audience and then targeting these people with relevant ads. Its surprisingly simple to do (see below for instructions) and can be an extremely effective way to push your offer or content to the people you have been engaging via email but through a different medium. Google, Facebook & Twitter find the correct people to market to by using the accounts people have setup with each network. Because of this it is not 100% accurate and you won’t be able to market to absolutely everyone. For example if one of your subscribers has joined your list with their work email address but has joined Facebook or created an account with Twitter with a personal email address they will not match and will not be found. Both networks are getting better at matching, however it is now possible to upload a database of phone numbers to Facebook & Twitter which increases the likelihood that they will find the right person to add to your audience. Promoting content/offers to your most engaged users on your email database (who are most likely to convert). Promoting special offers to those that do not open your emails regularly or have unsubscribed (similar to an email reactivation campaign). Pushing upsells, add-ons and repeat purchases to previous purchasers and cart abandoners. Increasing or decreasing cost-per-click bids based on performance of subscribers vs non subscribers throughout your advertising campaigns. Excluding your email or customer database from seeing all of your standard advertising campaigns (very useful for businesses that generate leads or sell products that are a one time purchase only). Creation of lookalike and similar audiences based on your email database to target new prospects who are similar to your past ones (which is a targeting method that in my experience works extremely well). Targeting of ads to purchased (or scraped) email databases that match your target market – you generally can’t email these databases as its against spam laws however this is usually not a problem on ad networks. There are many other ways you can utilise these audiences and market to (or exclude) your email databases, as with all online marketing however its all about results. CRM Remarketing is not the ‘magic bullet’ to your online marketing success, and still requires tracking, testing and a lot of optimisation to get the best performance possible. It is however another handy tool in your marketing arsenal that should be utilised. So how do you setup and market to these audiences? Its actually pretty simple! Simply follow the instructions below for Google Adwords, Facebook or Twitter ads and then remember to frequently refresh the audiences you have created so when new subscribers join your list they are added to your audiences (which doesn’t happen automatically yet). Step One: Download your email database from your current email provider in CSV format. If you have the users phone or mobile number ensure you also include this column in the download as Facebook can now match phone numbers where the email address cant be found. 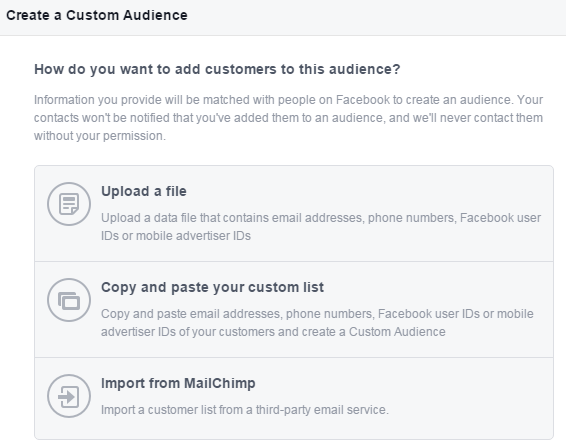 Step Two: Login to Facebook Ad Manager or Business Manager (depending how you setup your ad account) and go to Tools, Audiences and create a Custom Audience. Step Three: Select the “Customer List” option and then either Upload the CSV file, copy and paste it or if you use Mailchimp for your email marketing you can import a list straight from the service. 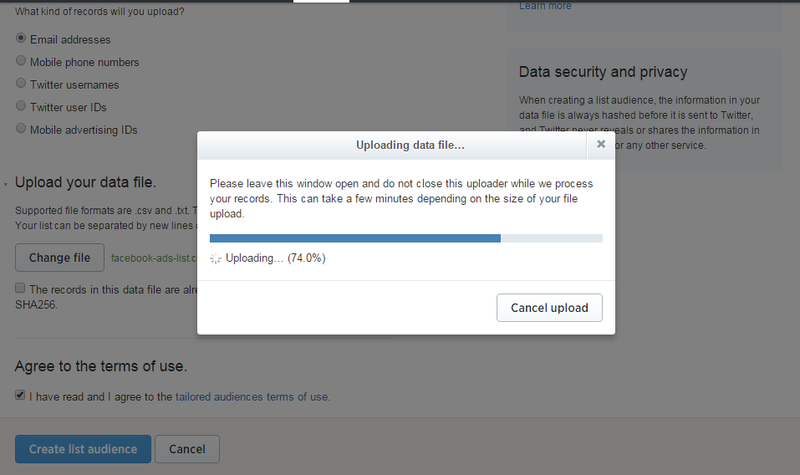 It will take around 30 minutes for Facebook to create your custom audience after uploading it. 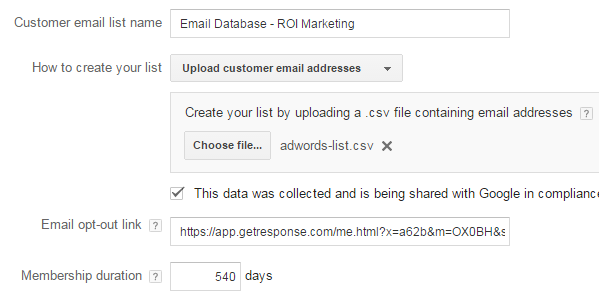 Step Four: You can now use your email marketing database as a custom audience and target ads at these people. Simply create a new campaign and select the audience you uploaded as the custom audience you want to target. You can use all of Facebooks other targeting options to segment your database further, for example you could target just men on your list aged 20-30 years old – be careful not to segment too much however or your audiences will be too small to get meaningful results from. Step One: Download your email database from your current email provider in CSV format. For Adwords your list must contain just one column of the email addresses with no header so you’ll likely need to edit the file. Step Two: Login to Google Adwords and navigate to Shared Library then Audiences and create a new Remarketing List based on Customer Emails. Step Three: Name your list and add the CSV file, you’ll also need to confirm your list meets Googles requirements and provide a link to your email platforms unsubscribe functionality, the best way to get this is to send yourself a test email or look for a past campaign, hit unsubscribe and paste this link. You can set the number of days you want people to stay in the list, this should be set to the maximum which is 180 days. It will take Google a few hours to process the list before you can use it. 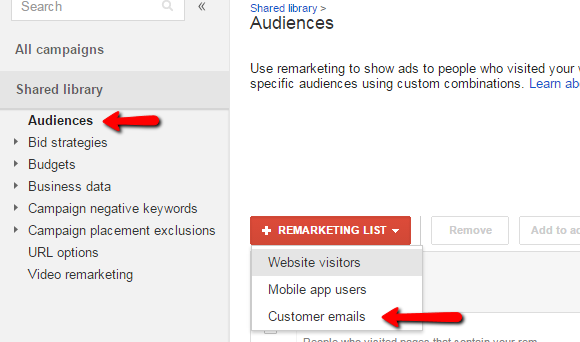 Step Four: Once your list is ready you can use it similar to a remarketing audience. 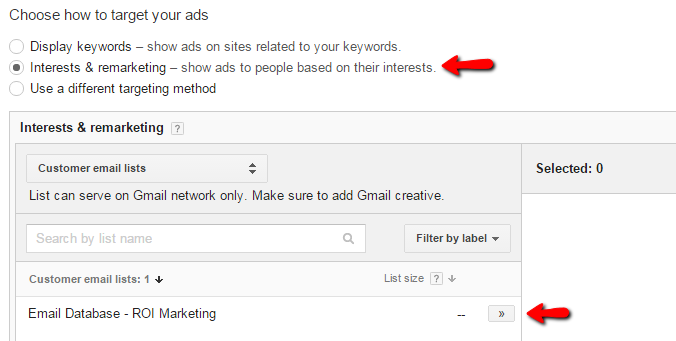 Simply create a campaign and when you get to choosing how to target your ads select the “Interests & Remarketing” option and find your Customer Email List and add this as the targeting. At present as its quite a new offering from Google you are limited to Google Search, Gmail on the Google Display network (to enable this add the placement “mail.google.com” and create Gmail Sponsored Promotion ads) and Youtube advertising with these lists. I expect all Display sites will also be included soon. To exclude your email database from seeing ads in your other campaigns simply add the audience as a “Campaign audience exclusion” on each campaign. Whilst you’re there ensure your exclude the placement adsenseformobileapps.com on all Display campaigns to stop your ads showing in apps. Step One: Download your email database from your current email provider in CSV format. Like Facebook, if you have the persons mobile phone number you should also include this field as it can be matched to a Twitter user if the email address is not found. Step Two: Login to your Twitter Ads account and go to Tools, Audience Manager and then Create A New Audience selecting to upload your own list. Step Three: Name your audience a relevant name and select whether its a database of email addresses or mobile phone number and upload your CSV file. It will take some time for Twitter to process your database, find the right people and create the custom audience, once it is complete they will then email you. Step Four: You can now use your email marketing database as a Twitter ad audience and target ads at these people. You can do this by creating a new ad campaign and adding the tailored audience you just created as an additional targeting criteria. Your email list can also be segmented further with Twitters other targeting options, for example you could (and should) target just people on your list in your target geographic location.